Does Outsourcing Make You More Secure? Outsourcing is good, since we cannot specialize in everything we can focus on sales or inventory instead of mundane tasks. So what is important and what is mundane? That depends on your business… most businesses are not a software company, so obtaining software needs by outsourcing may be smart. Then the question is should you buy software or just rent the software on a server(“the cloud”) on the Internet? The answers to what is important depends on your business. Obviously if you are a restaurant, it is food. But what if it is not as obvious? How about if you are selling services online and offline(with sales people)? Every business has customers or patients, (whatever the industry term is). And every business has to get paid somehow. So the payment information and customer database has to be secured in all businesses(or for that matter non-profits as well). Customers are important to the business since they keep the business afloat. Thus everything to do with our customers is important to us and our competitors. Of course employee data is also important to keep secure. This methodology is the same line of thinking when you set up a risk management analysis. Depending on the business some important information electronically may be how one creates a product. For all businesses the financial transactions, accounting and anything to do with money has to be safeguarded. Overarching needs of Identity Access Management(IAM) is important. Sales of items not unique(commodities) retail, wholesale, restaurants etc. 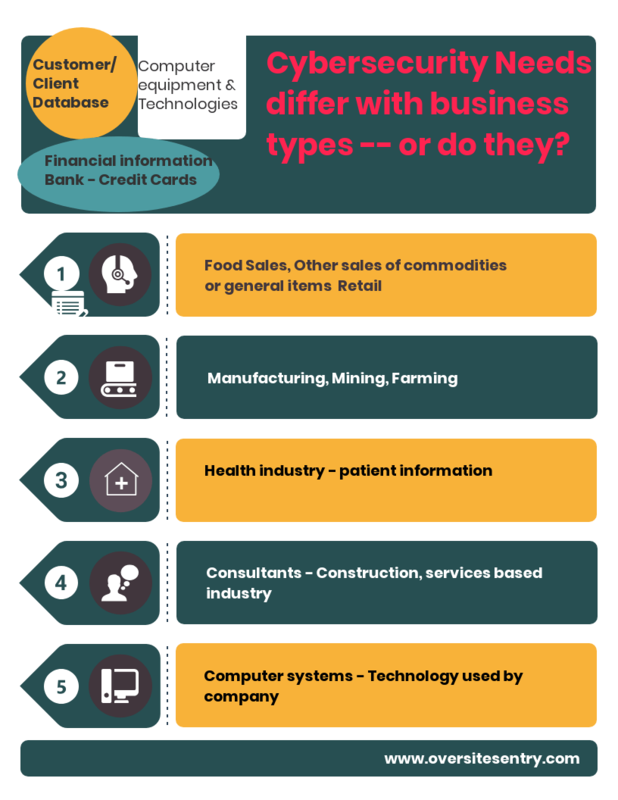 All of these businesses have some things in common, even if not all of them may have IP (Intellectual Property), Customer database, Computer Equipment, Financial Information (accounting). The commonality of the computer systems, accounting,customers, and employees makes all businesses think what exactly do we outsource? the experts say outsource the functions that are not central to your main business model. So everyone except for accountants could outsource the financial applications by using online Internet apps in the cloud(someone else runs the computer). Notice, I do not say the reason to outsource is to be more secure. Security on the Internet is not predicated on whether you outsource to the cloud. To outsource has to do with business reasons not security. The bottom line in the year 2018 and beyond Cybersecurity must be in everything no matter what. The key is even though we expect it(Cybersecurity) we do not want to overpay. So this is where the next stage of our analysis comes into play. RISK MANAGEMENT – is a direct result of what is important to the business, what is outsourced, and how to allocate resources. Every business is different, and must make the choices to weigh the needs of the business. If you have IP then that could be more important than customers, since the customers will come back to you if you have the IP. But if there is no IP, the most important functions might be a close tie between customers and financial (Credit Card or bank information). Everyone has Computers that connect to the Internet, here is where the true outsourcing idea can come to fruition. So we still have to secure our personal devices to connect to the cloud. Social Engineering and scams can always take over and steal your hard earned resources even if you have good security. So the reality is outsourcing or “the cloud” does not matter. Secure your devices!! Keep up to speed with changing cybersecurity landscape such as in our Security News Analyzed page. Contact us to make this happen by using security policies, risk management analysis and more. Next Next post: NIST 800-171 Compliance Can be Done Quickly!